Born in 1915,in North Bend, Oregon. I will be 93 years old on Aug 8, 2008. I graduated in 1940 from Colorado School of Mines as a Geologist. My first job out of college was working for an oil cdompany in the swamps out of Morgan City, Louisiana. In December 1940, I was drafted into the U.S. Army as a buck private. My year was almost up, when Pearl Harbor hit. They sent me to Officer Candidate School, where I became an officer at Ft. Belvoir in the Army Engineers., 4 years later, I left the service as a Captain. I then worked for HYumble Oil (Now Exxon-Mibil) in the Houson, Tx. office as a specialist in the study of underground oil and gas reserrves. 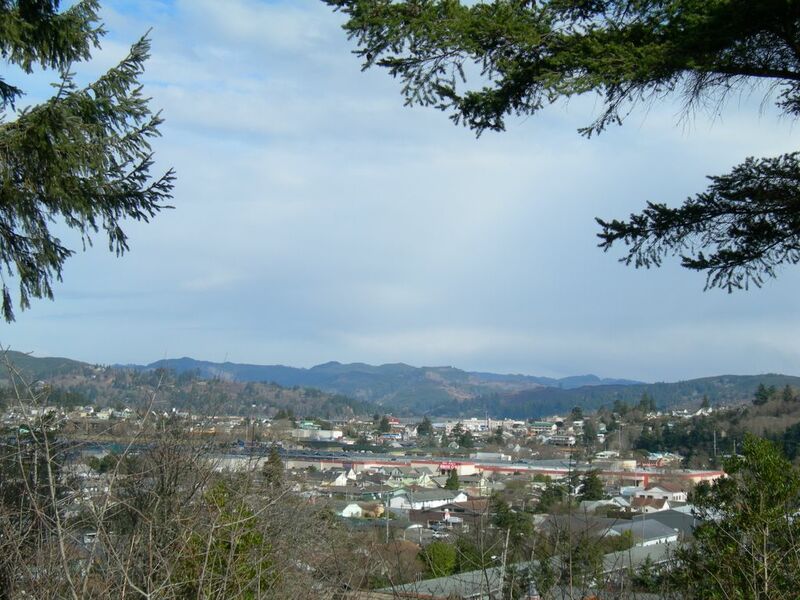 In 1947 I returned to Coos Bay, Or. spent 19 years in the restaurant business, built a bowling alley, owned 3 service stations and 17 years in the real estate business. I retired at age 65 in 1980. I then got involved with the mining business in gold silver and zinc. Like the old saying, "what goes around, comes around." I started with mining and end up with mining. My wife, Kay and I celebrated our 65th Wedding Anniv. We have 3 fine kids, One girl and two boys. There are 470 families registered in Holy Redeemer Parish. 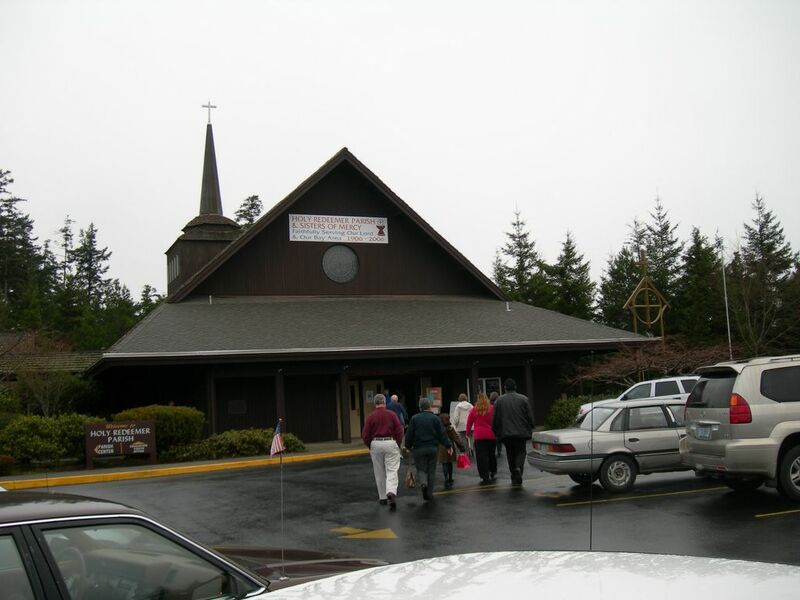 Our parish is about the same size as St. Monica in Coos Bay, OR. The copper clad steeple, high above the altar is 72' tall with a 5' stainless steel Cross on top. Light for the Sanctuary comes in thru the 14' horizontal Rose Window. 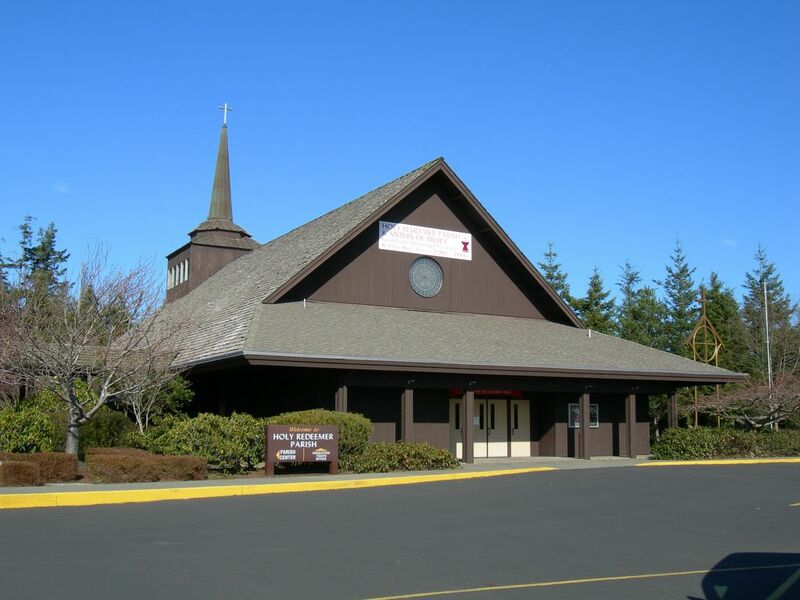 The Cruciform style church was dedicated in Dec. 9, 1976. The building is 48' x 140' or 6,720 sq. ft. and contains 17 pews on each side which will seat 340 people. For large events, chairs on both aisles and the center will hold another 70. A half basement beneath, serves as a Youth Center. It was built under the leadership of Fr. Deis at a cost of $400,000. Pews, organ, priceless stained glass windows artifacts and other fixtures, give it a current value of nearly one million dollars. The adjoining parish hall, built in 1981, cost $300,000. 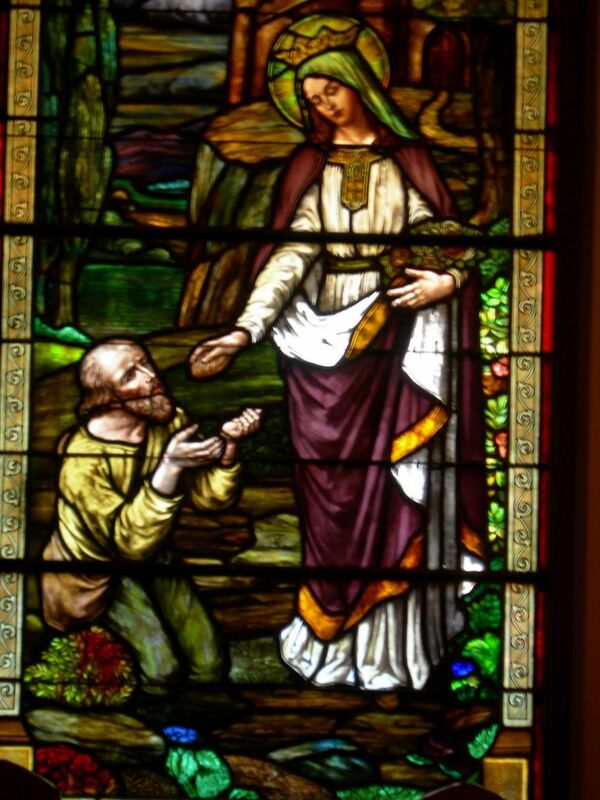 Today, Holy Redeemer parish is free of all indebtedness. 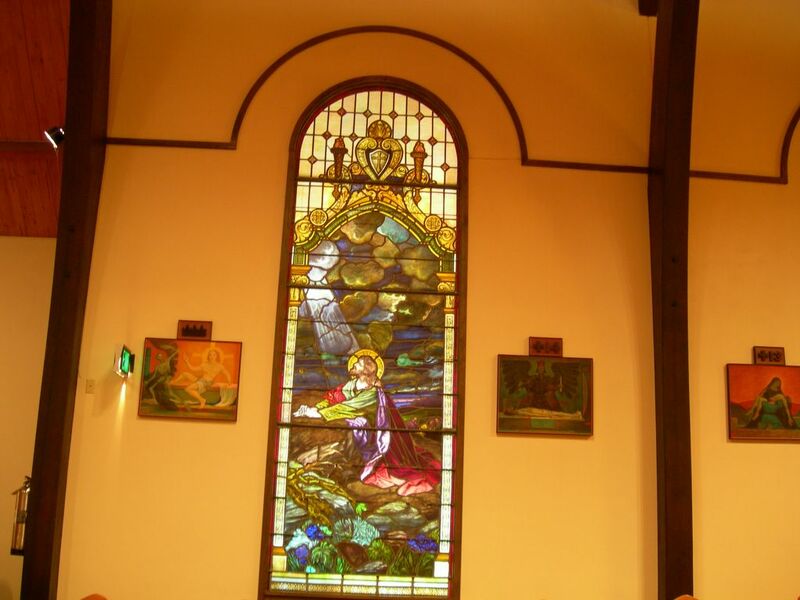 This slide show is in honor of the 100th anniversary of the North Bend Holy Redeemer Catholic Church 1906 to 2006. It was made by George E. Gebhardt. Be sure to save it on your FAVORITES, for future recall. We call this a "blog". or a series of pictures with accompanying stories. A blog is also an abbreviation of a "web log" or some call it a "book log". To open the show, when you get the e-mail, click on the colored so called blog, The beauty of the program, enables you yo forward this e-mail anywhere in the whole world and show these same pictures. Also, click on the picture to ENLARGE IT., then click on GO to return to the show. Note: it may not work on some slow computers. 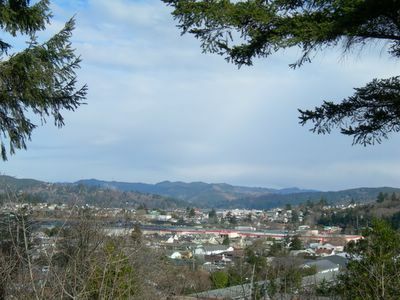 A beaitul view of North Bend, Oregon, looking East from the bluff by the Administration office. It is Father Karl's and George Gebhardt's dream that a small CHAPEL could be built in or near this location, (capacity 50 plus). 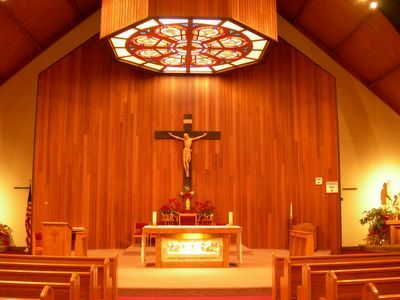 It would be used for daily masses, small funerals etc.The very large and high ceiling Crusiform Style main church takes a lot more energy to heat. Mike Crow, the architect is drawing a sketch of a proposed chapel, to be discussed in the near future. Holy Redeemer's Church built in the Bangor Heights Area of North Bend, Oregon. 12/9/1976 and blessed by Archbishop Cornelius Power. The large billboard, high in the gable in front of our church, tells it all. 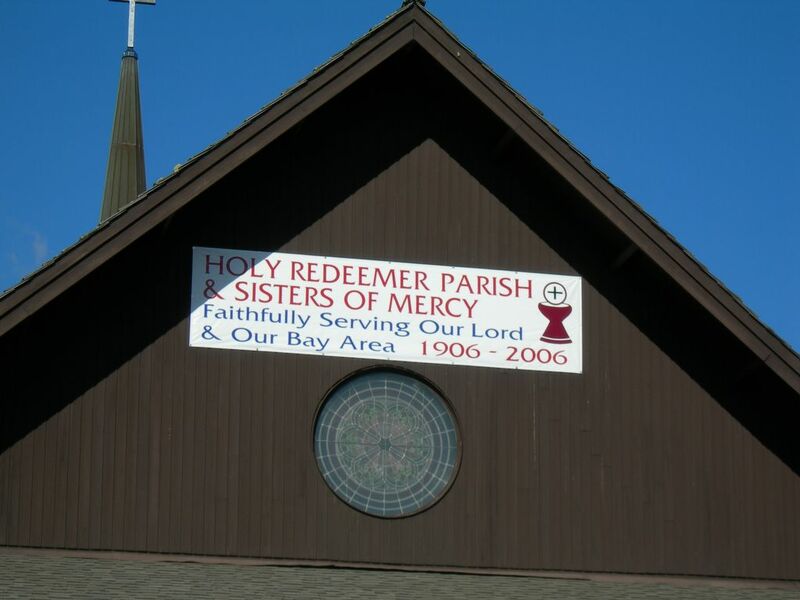 Holy Redeemer Parish and Sisters of Mercy, faithfully serving our Lord and our Bay Area. One Hundred year Anniversary. 1906-2006.The Archbishop will be in our church October 1, 2006 for the ceremony. 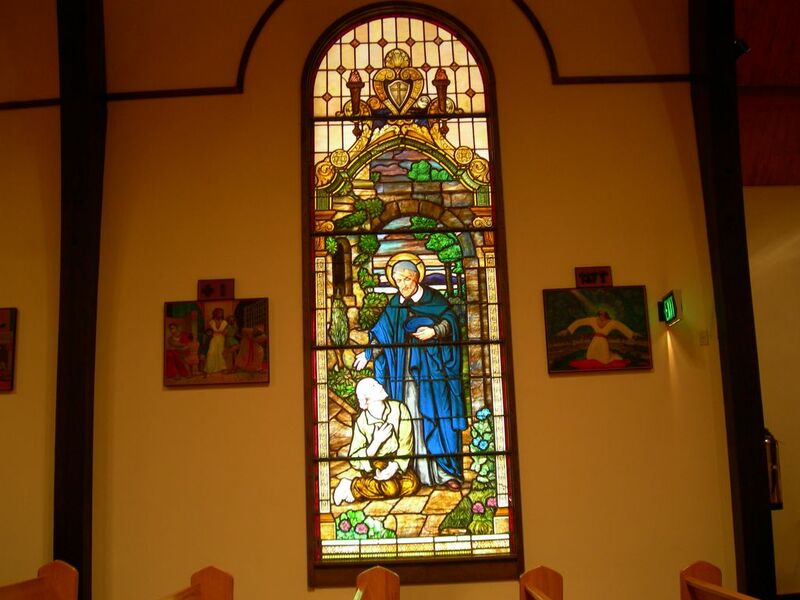 Note the leaded glass window taken from the old church on Sherman Ave. It is mounted high in the loft of the Choir. St. Elizabeth was a princess of the country of Hungary. She built a hospital for the forgotten poor. 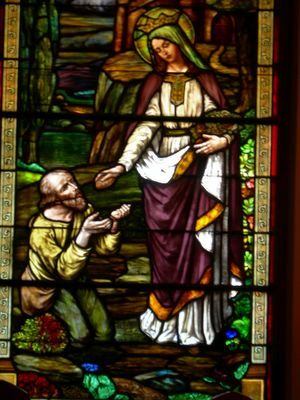 Her gifts to the poor and a large gift of grain to a famine stricken Germany, made her the patron saint of hospitals, bakers, beggars, homeless, tramps, widows and many other charitabole fields. Her family vigorously opposed her doing this. She was the mother of four children and died at the very young age of 24. She was declared a saint, four years later. This close up of the stained glass windows is world famous and this piece of art work is priceless. Jesus in the garden of Gethsemani or the mount of olives. It is the scene of Christ's agony and betrayal. Math 26:36. Jesus fell prostrate for the 3rd time in prayer, "My Father if it is possible let this cup pass me by, still let it be as you would have it, not as I." Look closely and you can see his disciples sleeping behind him. He asked them to remain awake while he prayed, but they did not. Fially he said, "The hour is upon us when the Son of Man will be handed over to the evil men by his betrayer." This close up of the leaded glass window is of patron saint, Vincent de Paul, ordained a Franciscan Priest in 1600 at the age of 20. 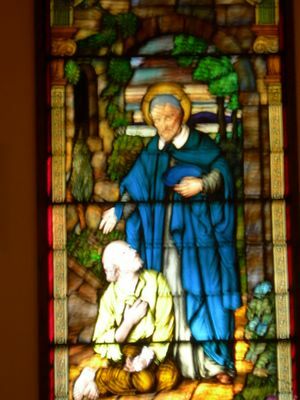 As a parish priest near Paris, he started a society fo helt the poor, nurse the sick and find jobs for the unemployed. The members are known as Vincentians in an international society of charity, by their spirit of poverty, humility and sharing. They make no distinction in those served, because in them, Vincentians " see the face of Christ." 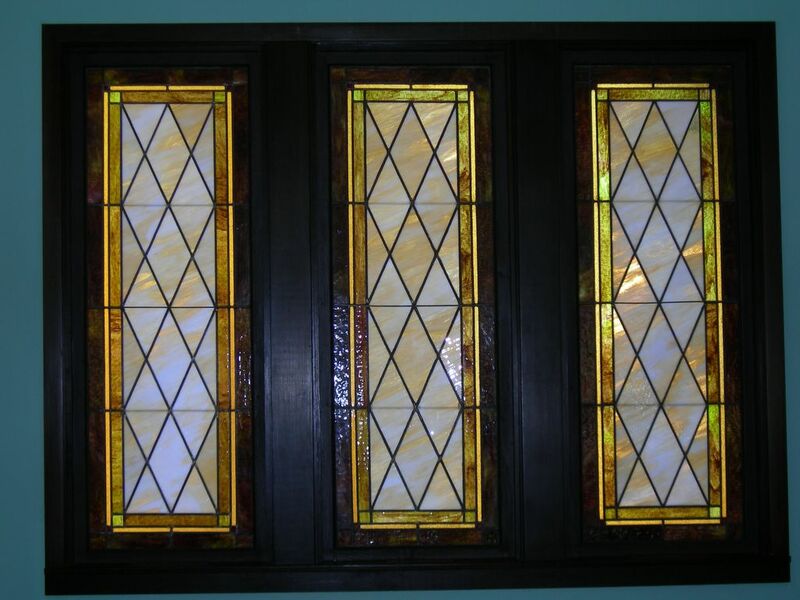 This is a close up of the 5' by 9' tall leaded windows. Jesus performed many miracles, curing the sick, the blind, the lame and even the lepers. As his reputation grew, multitudes of people came to listen to see him and to receive his blessings. Jesus had a special feeling for children. 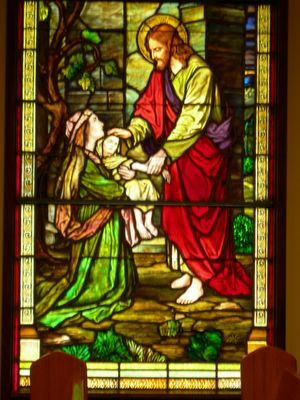 Here in the stained glass window, a mother kneels before Jesus, asking for a blessing or possibly a miracle to cure her small child. The 2nd of the two tall windows. If you go in the church, you will see there is room for one more, on each side wall. We were told the two missing ones were so badly vandalized that they were not repairable. NOTE--In the next four pictures, you will see a close up of the main part of these four windows with a story about each of the scenes depicted. 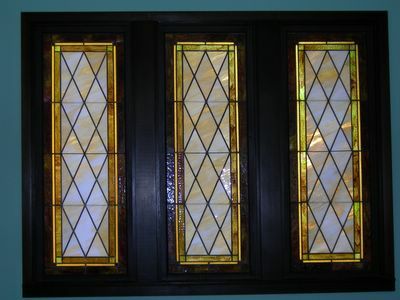 The church was "BUILT AROUND" 4 tall leaded stain glass windows. that measure 4' by 9' The St. Vincent Chapel in Portland was being torn down and there as a lot of vandalism. Fr. Deis, our church building pastor, heard about it. 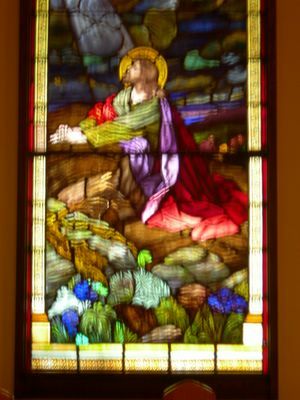 He and Don Swenson went to Portland and brought back 4 of the heavy windows, the 14' Rose Window, the Pieta, the tabernacle, the last supper. All these priceless items were donated to the Holy Redeemer, 3 years in advance of our proposed construction date of 1976. Don said they hauled all of this on one big flat bed truck, with out a tarp and nothing tied down. 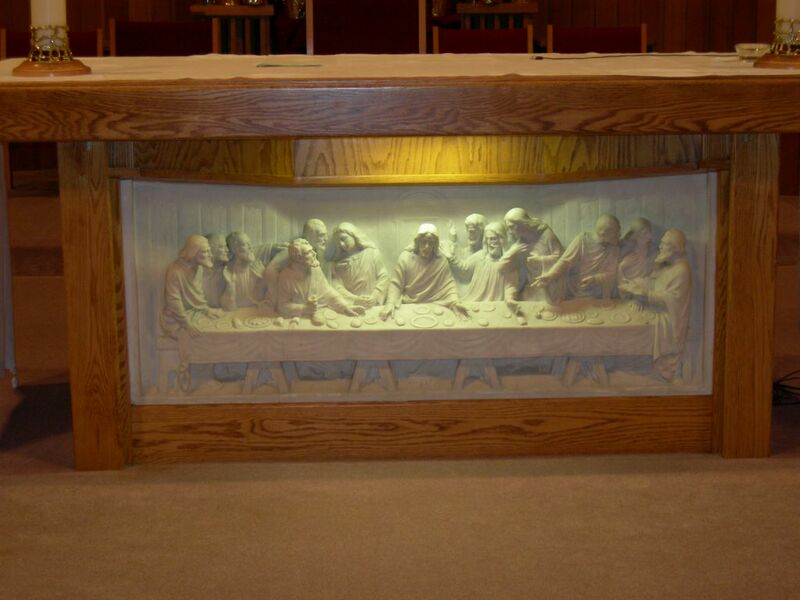 These items fit perfectly into our Cruciform style church. "The Last Supper" by Leonarda da Vinci, was donated to our church by St. Vincent's chapel in Portland thru the efforts of Father Deis. The disciples, shown here, are all reacting in horror or grief to the thought that someone at that table would betray the master. 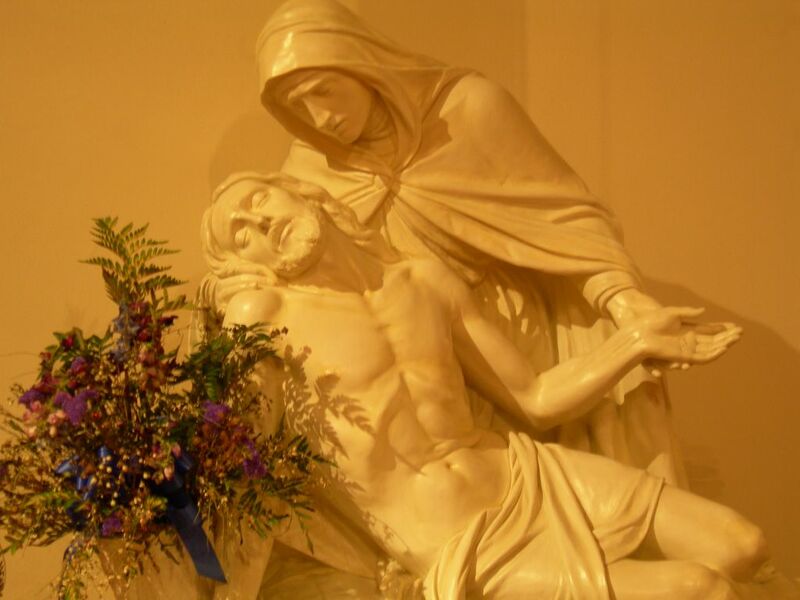 The Pieta by Michelangelo 1499 , is to the left of the Altar in Holy Redeemer Church. This famous art works depicts the body of Jesus in the arms of his mother, Mary, after his death by crucifixion. The 23 year old arrtist exhibits every muscle, vein and nerve of the Christ;s dead body. The life size marble-like statue from St. Vincent's chapel, though badly damaged, was repaired by Father Floyd. This is also known as a Rose Window which hung vertically for 62 long years behind the altar at the old church on Sherman Ave. Several feet of leaded glass were added to the outside to make it 6' in diameter. 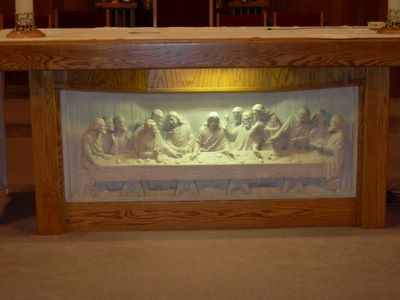 It was taken to the new church in Bangor in 1976 and mounted in the choir loft. 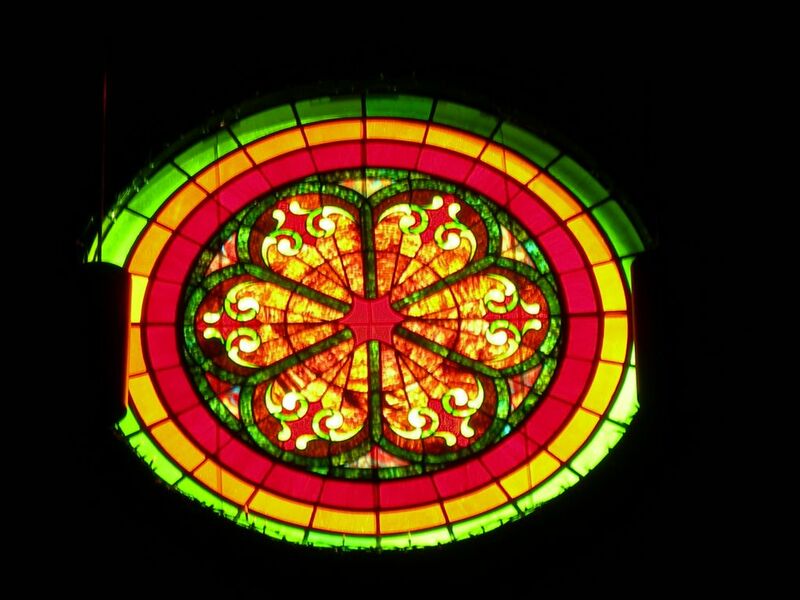 The 14' Rose Window hangs horizontally above the Altar. Directly above it, on the outside of the church, is a large multi-windowed "Cupola" which permits light to enter the Rose Window. The tall copper clad spiral and cross are mounted on top of the Cupola. The tabernacle is located opposite the Altar on the left hand side. 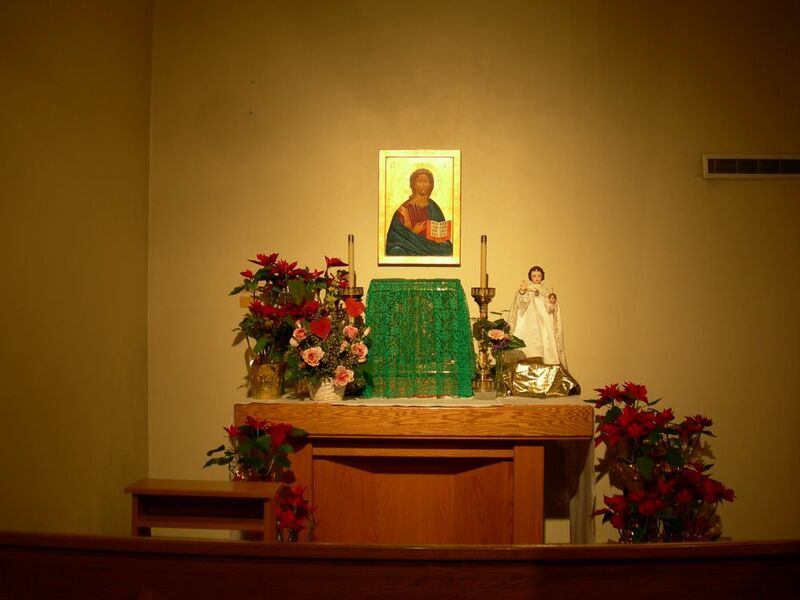 This is where the hosts are kept after they are blessed and consecrated. Note the "icon" of Jesus, mounted above the tabernacle. The icon is an ancient type of art, made up of multi layers of paint and gold leaf. 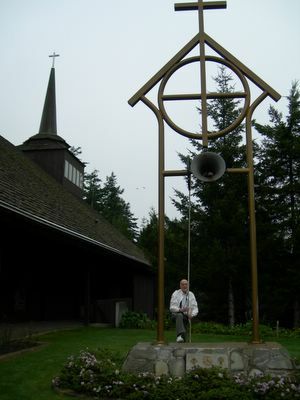 George Gebhardt is ringing the bell for the 8:30 AM Sunday Mass. This is the bell taken from the old church on Sherman Ave.. This aluminum frame bell tower was designed by Mike Crow of our church. Those who paid for the structure are given cridit with a plaque at the bottom. The rope goes over a special wheel, mounted on a trunnion that swings the bell. Plans were discussed to ring the bell electronically. 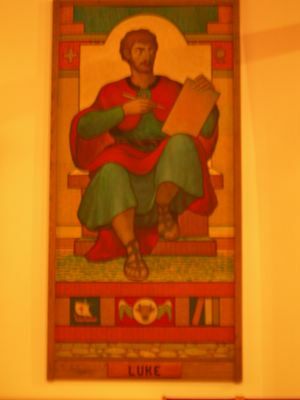 The story of Mathew, Apostle and Evangelist. He was a tax collector also known as, Levi. The Jews were his audience. He wrote the Gospels 37:68 A.D. 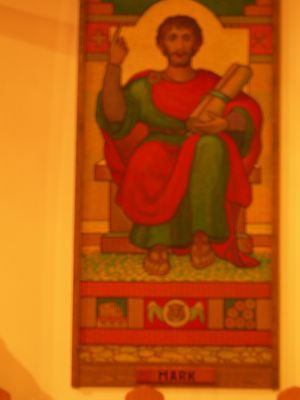 The contens were the depiction of Jesus as the King of the Jews. The key words were Kingdom, and fulfillment. The key verse was Mathew 27:37. The characteristics . Evidence to prove Jesus ws the promised Messiah. The fast facts: 29 miracles, 31 parables, 10 sermons, and 40 times the old testament is quoted. He wrote 28 chapters, 1,071 verses and over 23,000 words. He wrote the 3rd largest New Testament book. For his faith, he died a martyr. Note: Father Pius painted the next 4 "Evngelists" on 4' x 8' sheets of plywood. Mark, a Disciple and Evangelist was a missionary with Barnabus and Paul. Called a son by Peter. The Romans were his audience. 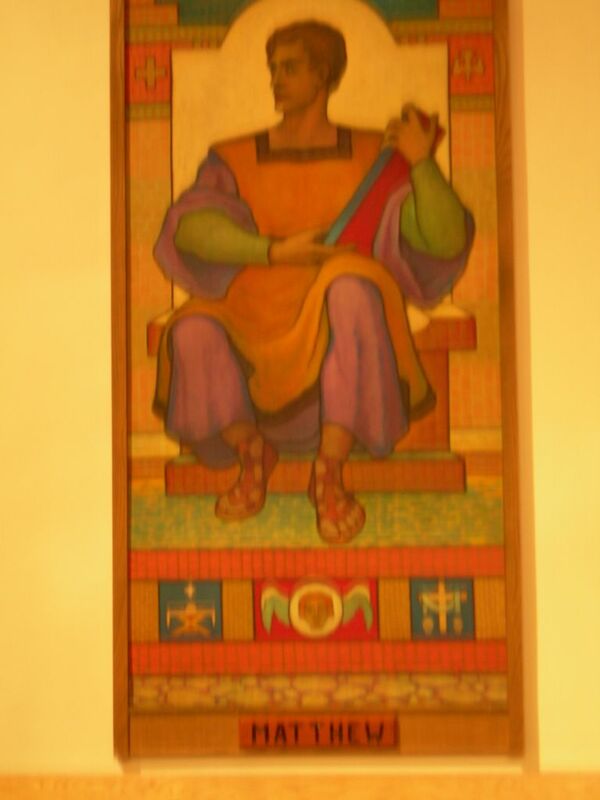 His was the 1st gospel written about 40 to 65 A.D He depicted Jesus as the powerful servant of God. Key words were authority, and immediately, found in Mark verse 10;45. They were written fast paced and very visual. The fast facts: 23 miracles, with 13 parables, 5 sermons and 23 times the old testament is quoted. All but 4 chapters give at least one miracle. He wrote 16 chapters, 678 verses and almost 15,000 words. His was the 5th largest written in the new Testament. For his belief, he died a martyr. 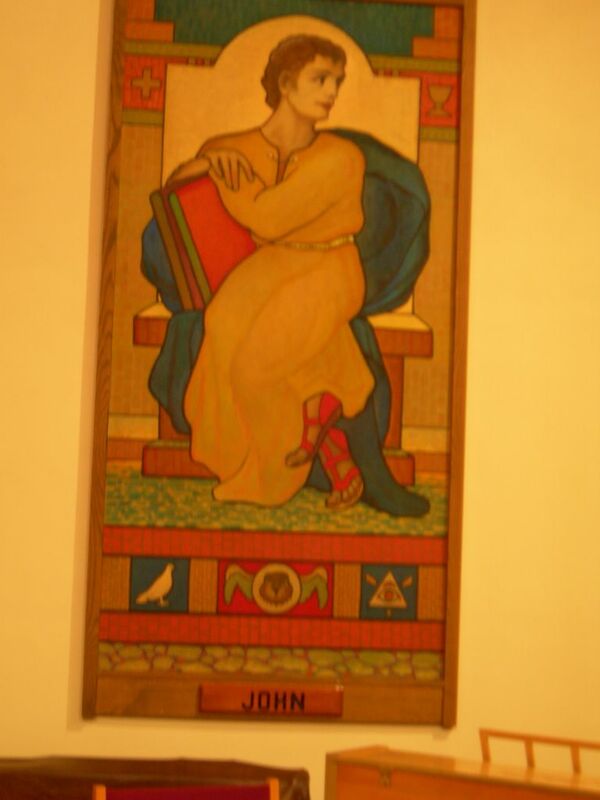 St. John, fisherman, Apostle, Evangelist and elder. He wrote 5 New Testament books. His was the last gospel written, 80-98 A.D. His audience was the Gentile Christians. He depicted Jesus as the Son of God. His key words were Belief, Life, World, Father, Son. The key Verse is John 3:16. His writings are known as "the gospel of belief." His teachings are presented as conversations. The fast facts. 10 miracles, 3 parables, 8 sermons, and 14 times the OT is mentioned. He wrote 21 chapters, 879 verses and over 18,000 words. His was the 4sth largest NT book, he died at a very old age. IN THE NEW TEST. & THE "ACTS"
St. Luke, Evangelist and disciple. The Greeks were his audience. He was a Greek doctor who traveled with Paul and wrote "Acts" as a sequel. He portrayed Jesus as the Perfect Savior of Man. The Key word was, Son of Man. (Luke, verse 19:10). His writings were careful and historical. The Fast Facts. 23 miracles, 37 parables, 13 sermons and 23 times the OT is quoted. Luke has 24 chapters, 1,151 verses and over 25,000 words. He died a martyr. 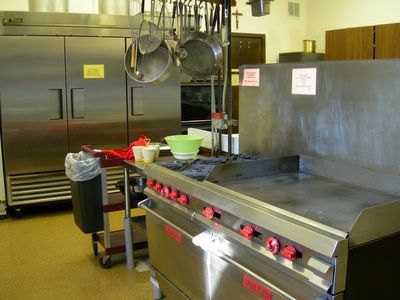 Remodeled kitchen in the church hall. See stainless steel refrigerators and gas fired stove. There are 470 families rfegistered at Holy Redeemer. The North Bend church is approx. 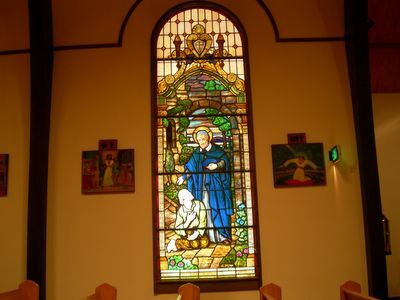 the same size as St. Monica in Coos Bay. The copper clad steeple on the North end of the church is 72 feet tall with a five foot stain less steel cross mounted on top. Phil Goetschalckx, did the welding for the cross and the Rose window above the altar. Redwood siding covers the outside of the church. The building is 48' x 140' or 6,720 sq. ft. and seats 340 people. There is room for 70 or more, using chairs for maximum crowds. AND THE SISTERS OF MERCY. This banner, high on the front of the church, tells it all. 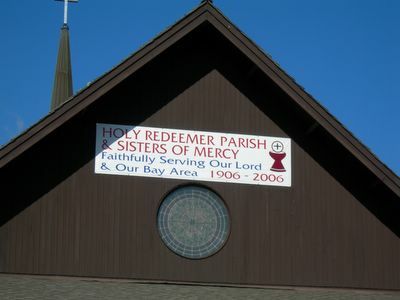 Holy Redeemer Parish and the Sisters of Mercy are celebbrating their 100th anniversary from 1906 to 2006. 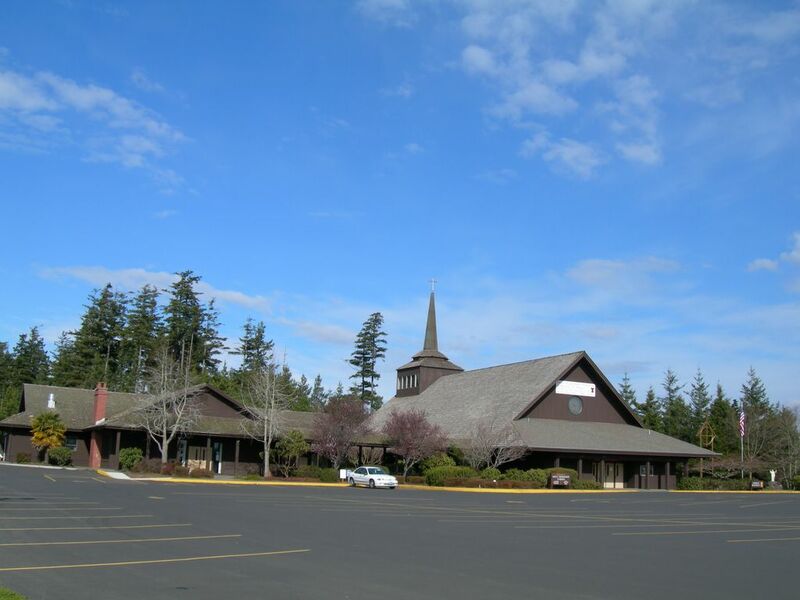 The Catholic Arch Bishop of Portland will come to North Bend to dedicate the church.